In Nazi occupied France a group of Jewish-American soldiers are sent to spread fear in the Third Reich. Known as the Basterds, the group brutally kills, scalps and scars Nazis throughout France. Joining forces with British allies and a German double agent, the Basterds intend to kill the ranking leadership in Nazi Germany. Quentin Tarantino has been making astounding cinema since the 1990s. He is a master at crafting a story together and has proven his craft time and time again. The esteemed director has done it once again in "Inglourious Basterds." An all around brilliant film that is deathly engaging, hypnotically scored, flawlessly performed and last but not least masterfully directed. Quentin Tarantino's "Inglourious Basterds" is a film that he has been working on for years dating back to before Kill Bill and Jackie Brown. It is a film that has meant a lot to the director for quite some many years and it shows in every regard. Quentin Tarantino put his heart and soul into this film. That is not to say that he has not put his heart into previous films, but that it shines through in such a resounding fashion. Needless to say Tarantino proves in every way how much he loves this film with his final line of dialogue, which breaks the fourth wall and addresses the crowd. For those of you who have not seen the film, I will not spoil it. But it should be noted that no other director has the guff to do what QT does in "Inglourious Basterds." I've never seen a Tarantino film that I didn't love the dialogue. I have however seen actors who did not display the ability to handle Tarantino's at times lengthy prose. That is not the case with "Inglourious Basterds." Every actor within the film is flawless. Standout performances come from Brad Pitt as Lt. Aldo Raine, Melanie Laurent as Shosanna Dreyfus, Michael Fassbender as Lt. Archie Hicox, August Diehl as Major Dieter Hellstrom and Eli Roth as Sgt. Danny Donowitz. Pitt's southern accent used throughout the film is remarkably hysterical, but the real performance of note comes from Christoph Waltz as Col. Hans Landa. Waltz is stunning as the Jew Hunter. He is both absolutely terrifying and pleasantly comical. Furthermore every scene Waltz has, he commands the viewers attention at all times. Like every other Tarantino film the score and soundtrack to "Inglourious Basterds" is legendary. From the opening song The Green Leaves of Summer to the infectious finale Rabbia E Tarantella the score beautifully matches the film. I love film score especially when it helps to sweep you away into a film and the soundtrack and score to "Inglourious Basterds" is some of the best music put to film this year hands down. Absolutely fantastic. One aspect to "Inglourious Basterds" that makes the 153 minute film stupendous is the fact that Quentin Tarantino blocked every scene on set. The working script used for the film read much like a novel. Every day the actors and production staff would work out the scenes with Tarantino on set. It falls back to my earlier point have how much Tarantino was putting into this project. He has a real passion for the story and seeing it done justice. While watching the film you can feel every aspect of Tarantino's passion pouring through the screen in a impressive fashion. "Inglourious Basterds" is the best film I have seen from Quentin Tarantino since Pulp Fiction. In fact it may even be my favorite film from him. It is not a decision I am in any rush to make either. I have Pulp Fiction apart of my life since High School when it first released. 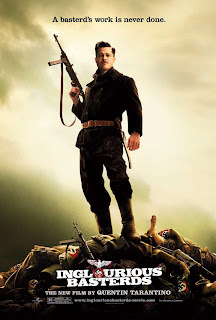 Much like his earlier films "Inglourious Basterds" is a film I expect to watch again and again gaining new appreciation and love for the film as the years pass. We've browsed through your reviews and thought that they are really original and interesting! We would like to invite you to publish your reviews on 7tavern.com, which provides an alternative platform for promising movie reviewers to showcase their talents. Based on the merit of your reviews, we intend to offer you exclusive publishing privileges on our website!